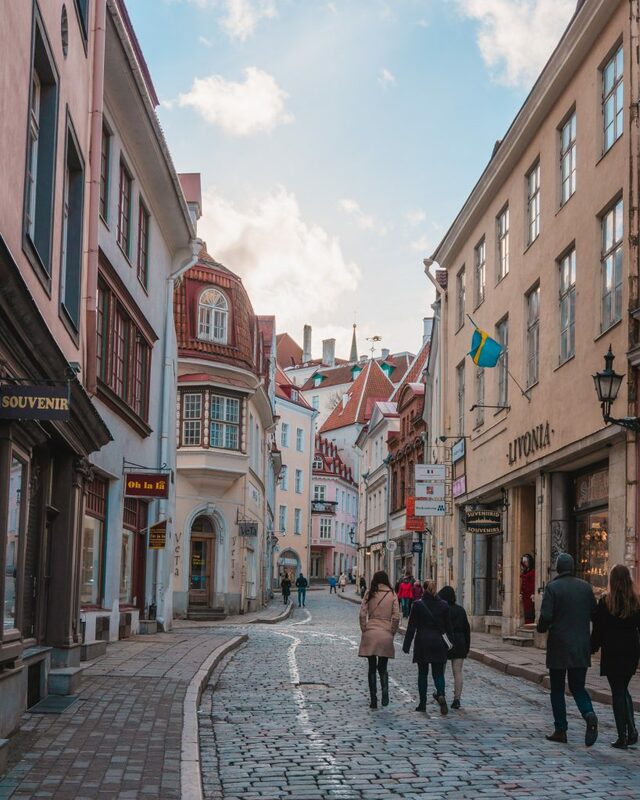 I love going back to cities I visited as a child to see what I remember and to properly explore them again – Tallinn was one of these cities for me! I first visited over 10 years ago and so it was high time to return. 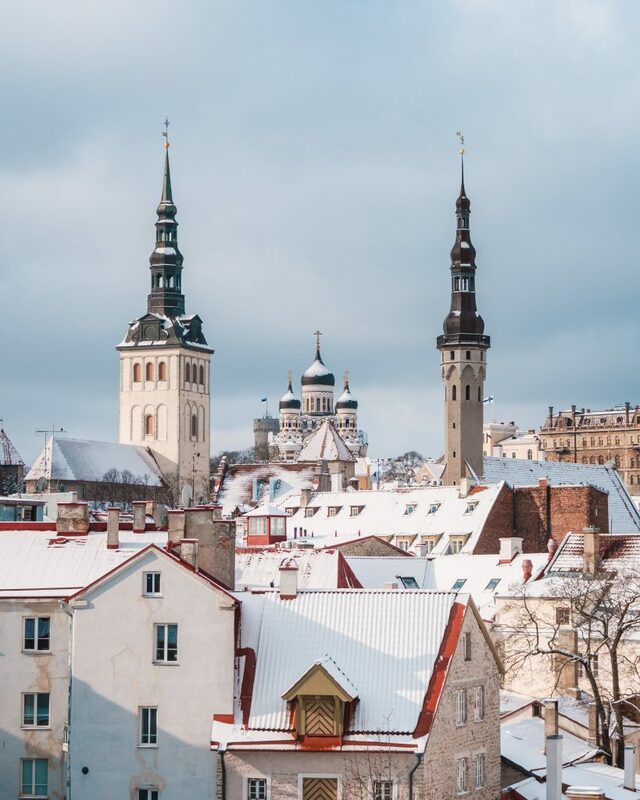 Tallinn is one of those cities that looks like a real-life fairytale as it has one of the best preserved medieval towns in all of Europe, which is also a UNESCO World Heritage Site. Two days in Tallinn is a perfect introduction to the city and to Estonia. 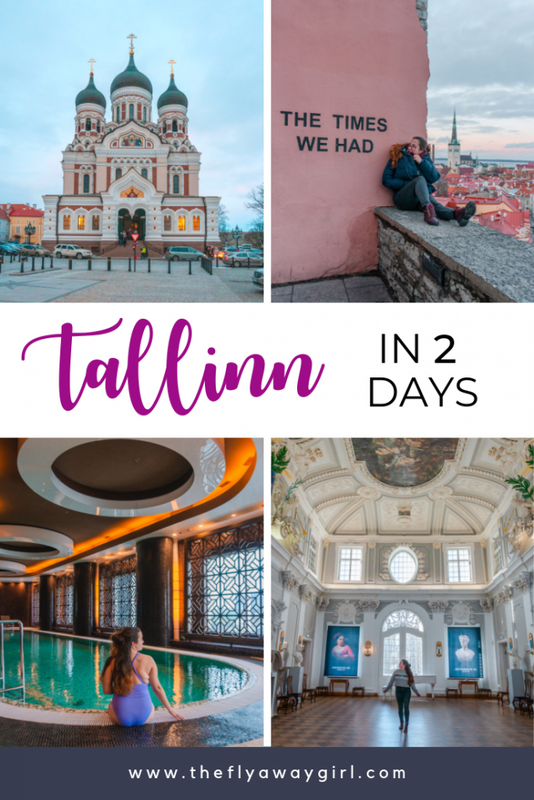 You can also combine this two day Tallinn itinerary with other cities in the Baltic or other places in Estonia, as well as a trip to Helsinki! Disclaimer: I collaborated with airBaltic, Swissôtel Tallinn and Visit Tallinn on this trip. All opinions are, as always, my own. Tallinn is the most northerly of the Baltic states, north of Latvia, west of Russia and south of Finland. You can travel to Tallinn by plane (to the airport TLL – Lennart Meri Tallinn Airport), by ferry or catamaran as well as by train or bus. If you are travelling from St Petersburg or Riga, you can travel to Tallinn by bus or train. 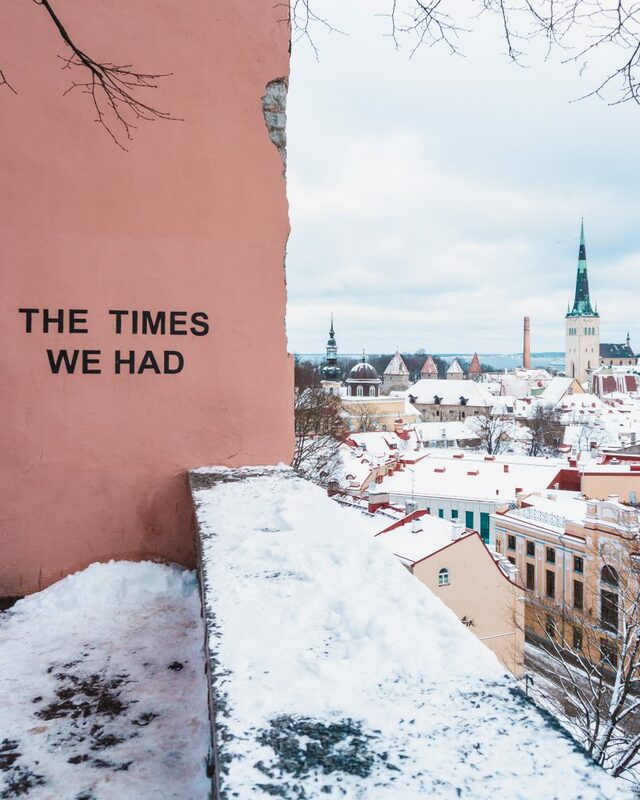 You can also fly from Riga to Tallinn or from Vilnius to Tallinn in just over an hour with airBaltic. By ferry, you can reach both Helsinki and St Petersburg – Helsinki is a popular spot for day trips from Tallinn and vice versa! You can also reach Mariehamn in Åland and Stockholm in Sweden by ferry. PS: Due to a law that allows cruise passengers to visit Russia visa-free for up to 72 hours, by taking the ferry from Helsinki or Tallinn to St Petersburg you can visit Russia without getting a visa! Travel with St Peter Line and book the city bus tour with them to be able to visit visa-free. 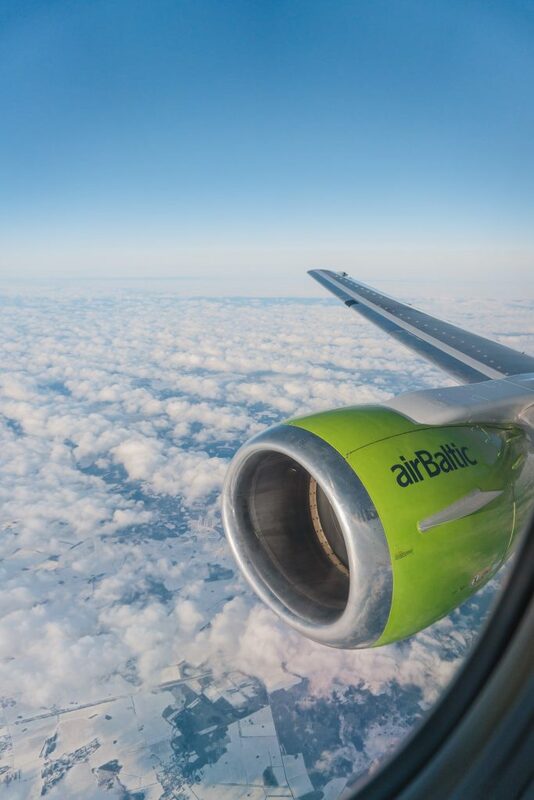 If you are travelling from further afield, airBaltic flies direct to Tallinn from a variety of airports including London (Gatwick), Riga, Oslo, Stockholm, Vienna, Berlin, Vilnius, Amsterdam and Paris. In June 2019 they will start direct flights to and from Brussels, Malaga and Copenhagen and in December 2019 direct flights to and from Salzburg. 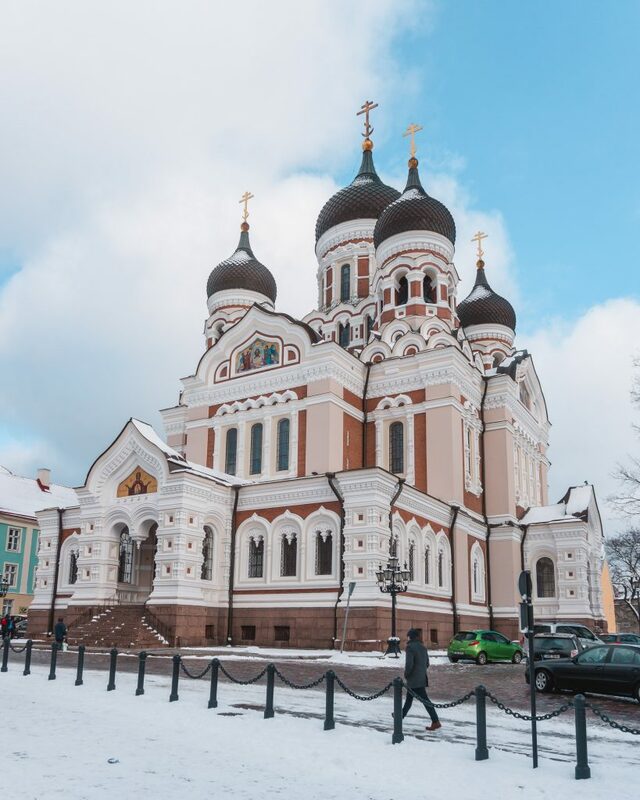 Fly direct to Tallinn from only €29 one way! 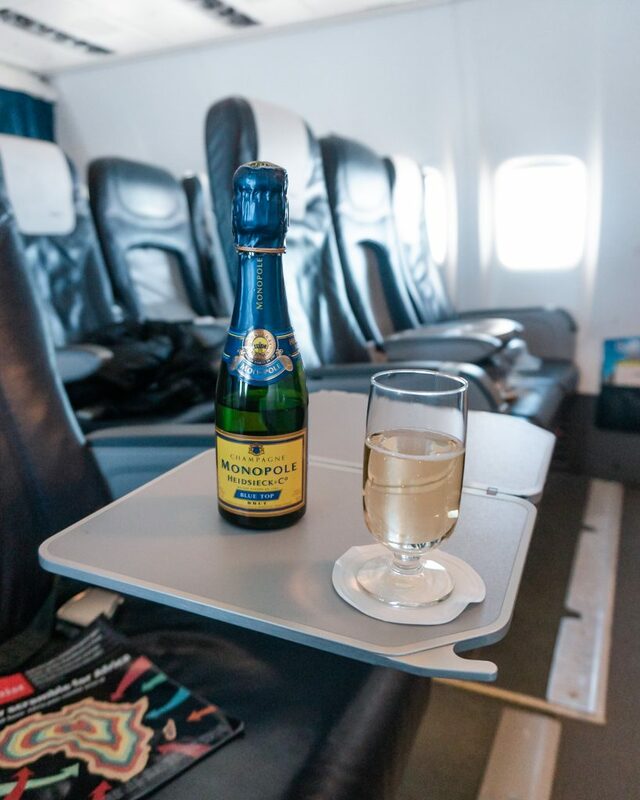 Fly with airBaltic in business class for extra comfortable seats and a delicious three-course meal with wine, champagne or other drinks! Tallinn is a pretty small city and the Old Town is extremely walkable. However, I would highly recommend getting the Tallinn Card in order to get free travel on the trams and buses in the city as well as free or discounted entry to pretty much all of the sights in Tallinn. 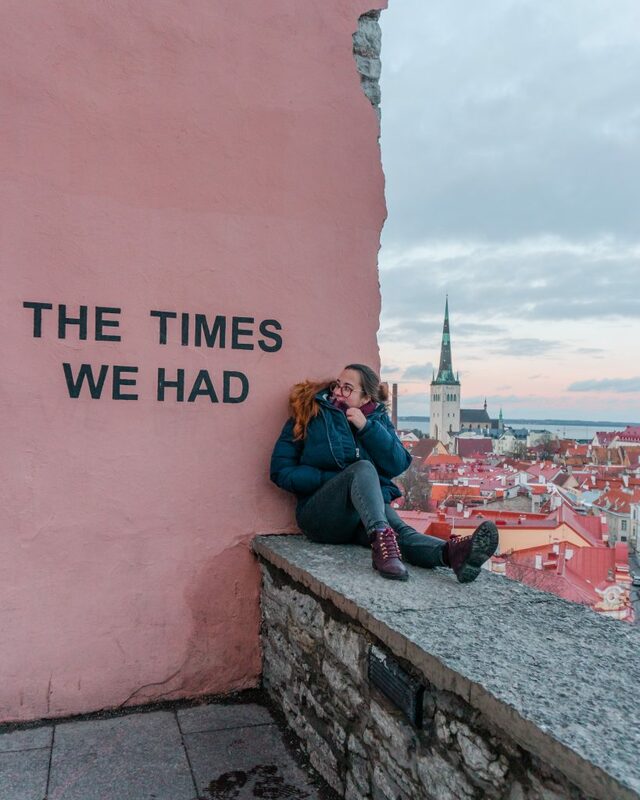 With only two days in Tallinn, you can get the 48h Tallinn Card (€39 for adults, €49 for the Tallinn Card PLUS) which will last for 48 hours exactly from the time you activate it (e.g. scan it on a tram). You can also travel by taxi, which we did when we arrived quite late at the airport and just wanted to get to our hotel and get some sleep. You can order a taxi with myTaxi or Uber. We stayed at the beautiful Swissôtel Tallinn, located a short tram journey from the old town. It is also a direct tram to the airport or a €5 taxi! The hotel is located in the tallest building in the city, providing amazing views over the old town and the harbour. 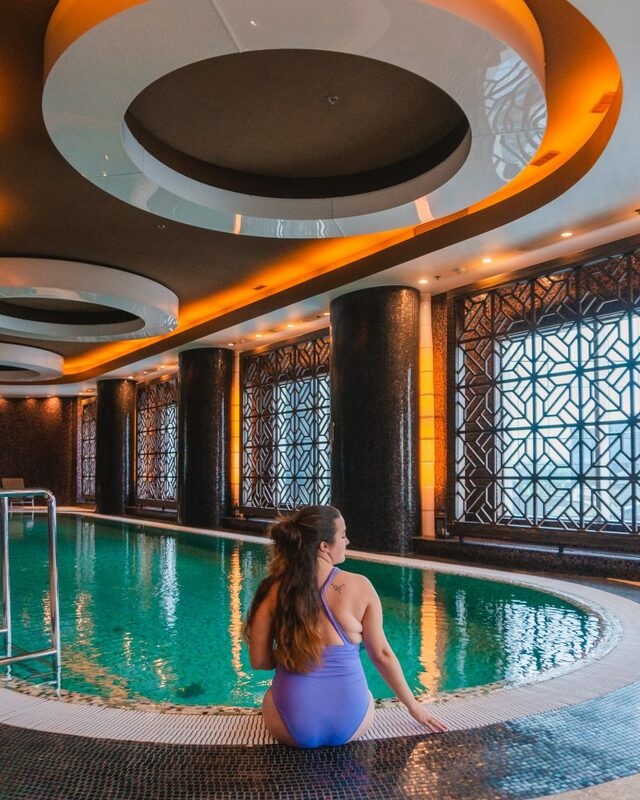 The spa at Swissôtel also makes your two days in Tallinn into an amazing relaxing break, with a large indoor pool, steam room and sauna as well as treatments like massages and facials. A stay at the Swissôtel Tallinn starts at €130 per night. If you are looking for a more ‘budget’ hotel, then the Tallink Express Hotel (from €70 per night) and Braavo Spa Hotel (from €80 per night) are well recommended! 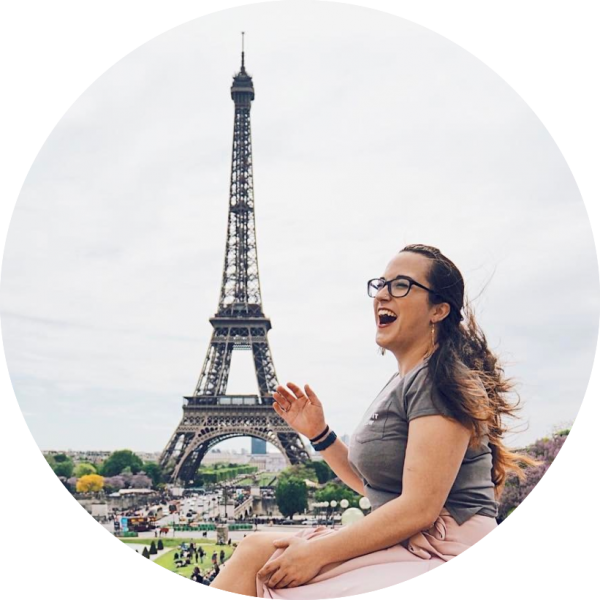 Top hostels in the city include Imaginary Hostel and Red Emperor Hostel, starting at €9 per night for a bed in a dormitory. 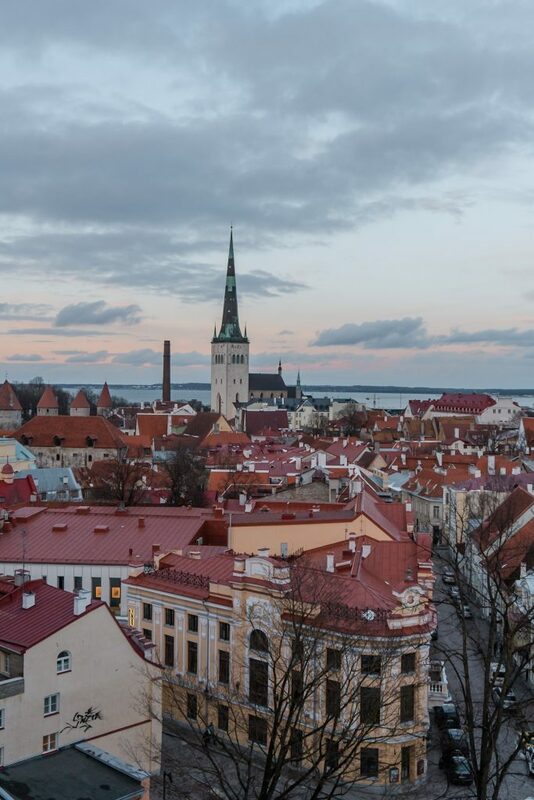 Wake up on your first morning in Tallinn raring to explore this beautiful city! 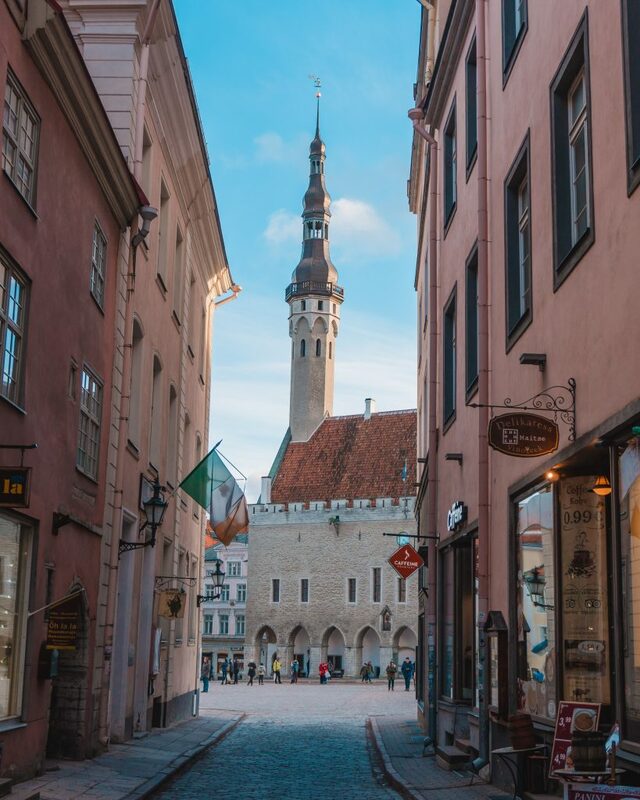 If you haven’t done so already, your first stop should be at the Tallinn Tourist Information Office to buy your Tallinn Card – you’ll want this for the public transport around the city as well as entry to some of the attractions. You can also buy it online and have it as a mobile ticket, so it’s up to you which you find more convenient. Before heading out to explore, enjoy a good breakfast to prepare you for the day. 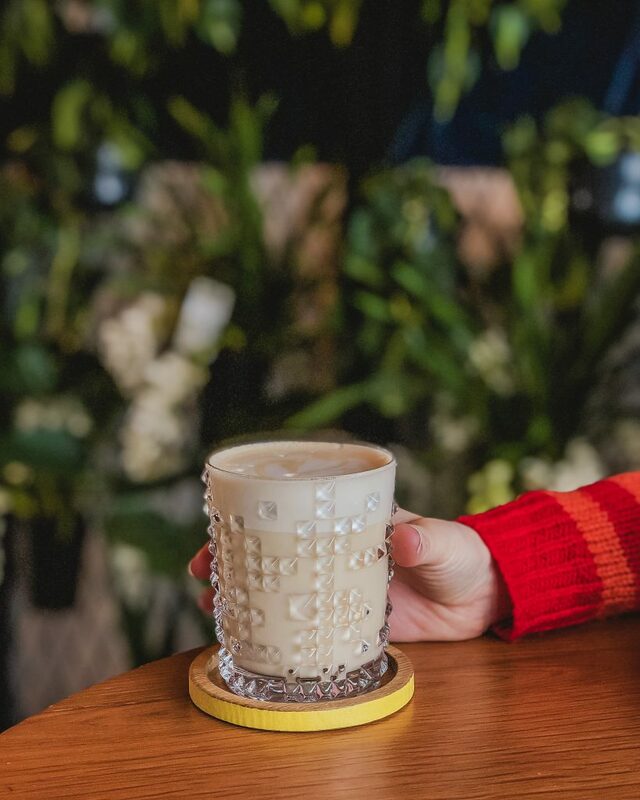 If breakfast isn’t included in your hotel or hostel rate, head to a great cafe like RØST, The Living Room Cafe or Uba ja Humal for delicious coffee and a bite to eat. You might be thinking that a seaplane harbour doesn’t sound like the most interesting place to visit… well, you’d be wrong! Lennusadam is actually the most popular museum in Estonia and is a great place to explore for both adults and children alike. You can take an audio tour (€2) or simply explore by yourself. Exhibits include the 1930s Lembit submarine, a full-size submarine that you can walk on and even go inside. 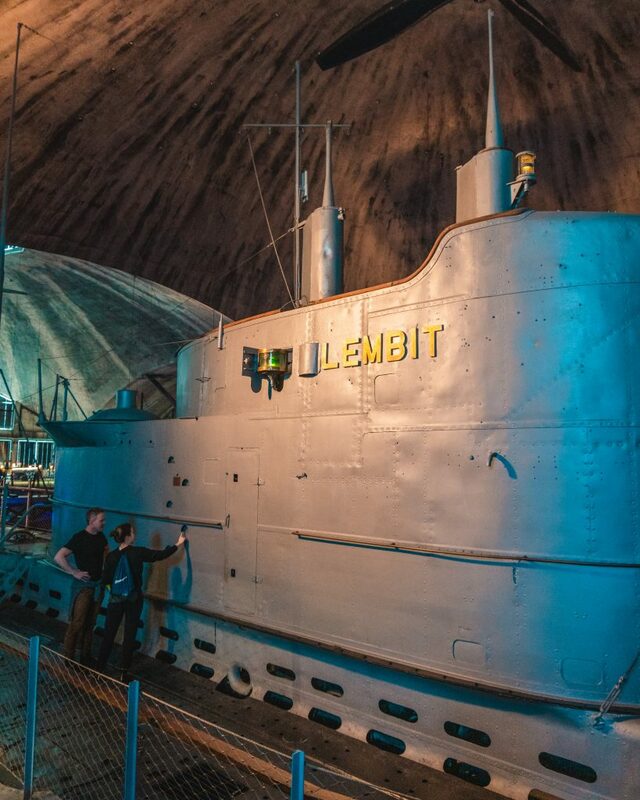 The Lembit was the pinnacle of submarine warfare at its time and is one of the few surviving submarines from before the Second World War. You can also visit the Suur Tõll icebreaker, which is located on the quay of the Seaplane Harbour. Lennusadam also has a variety of exhibitions that change during the years – I found the ‘Ensuring Estonian Freedom’ exhibition extremely interesting. It tells the story of the Estonian War of Independence and this exhibition runs until the 30th June 2019. After your visit to Lennusadam, hop on bus 73 to Mere Puiestee and change to tram 1. Alternatively (since the bus is only half-hourly), walk to Põhja Puiestee (about 15 minutes by foot) to catch tram 1 straight to the stop ‘Kadriorg’. By the time we had visited the Seaplane Harbour and got the tram to Kadriorg, it was high time for a bite to eat and (another) coffee. 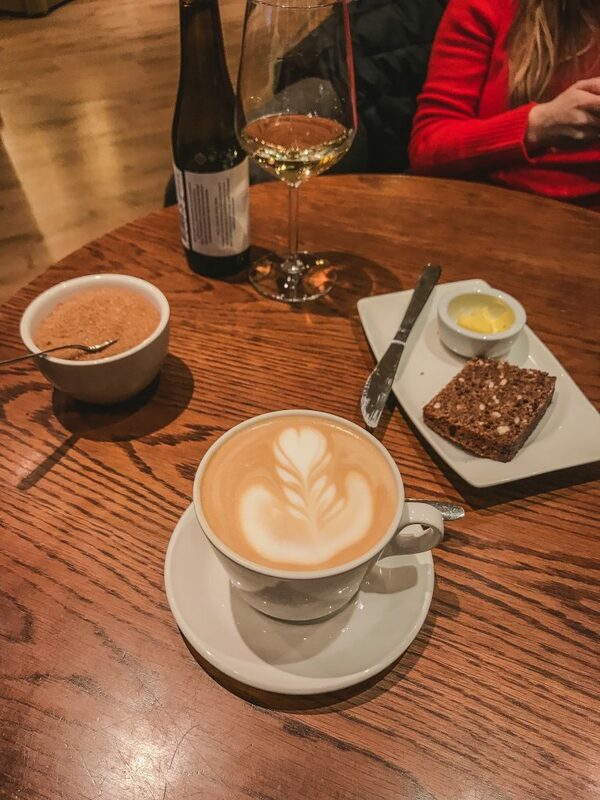 Gourmet Coffee is a small chain in Tallinn with three locations – they roast delicious coffee and have great meals on offer. 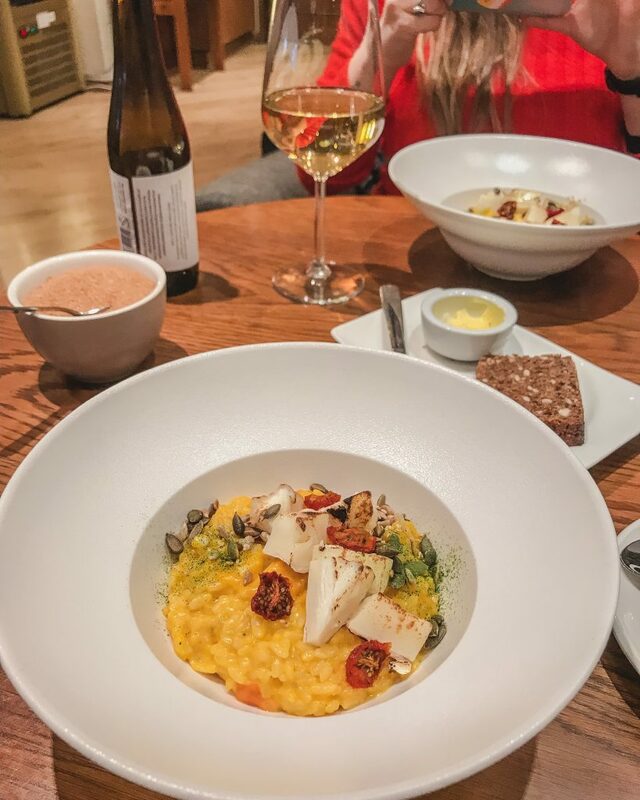 We both ordered the pumpkin risotto with local cheese and it was absolutely delicious! 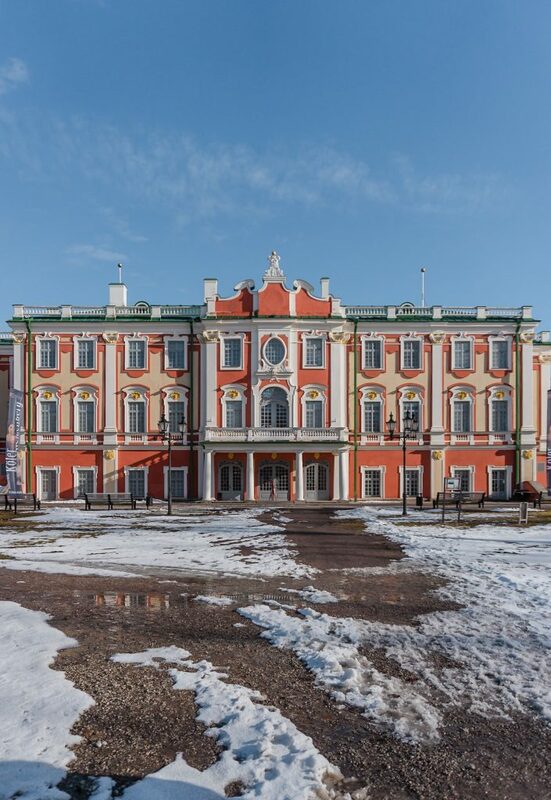 Now that you are well fed for more exploring, walk the five minutes from Gourmet Coffee to Kadriorg Palace. We actually managed to walk around the palace twice and then up to the Office of the President of Estonia (aka the Presidential Palace)… and then walked back and around the palace AGAIN to figure out how to get in. After a while, we figured it must be the door with a sign outside it. We tried the door and voilá, it opened. Either way, the walk around Kadriorg Park was very pleasant and the Presidential Palace was also very beautiful. When you visit, the entry is the door to what looks like the BACK of Kadriorg Palace – it’s a bit confusing! This side is the entrance! In Estonian, the Palace is called ‘Kadrioru loss’ and in German ‘Schloss Katharinental’. They both translate to ‘Palace of Catherine’s Valley’ and the palace was built for Catherine I of Russia by Peter the Great. Construction of the Baroque palace began in 1718 and was completed in 1725, but then in 1825 Nicholas I of Russia ordered a drastic renovation and the palace became the grand building it is now. 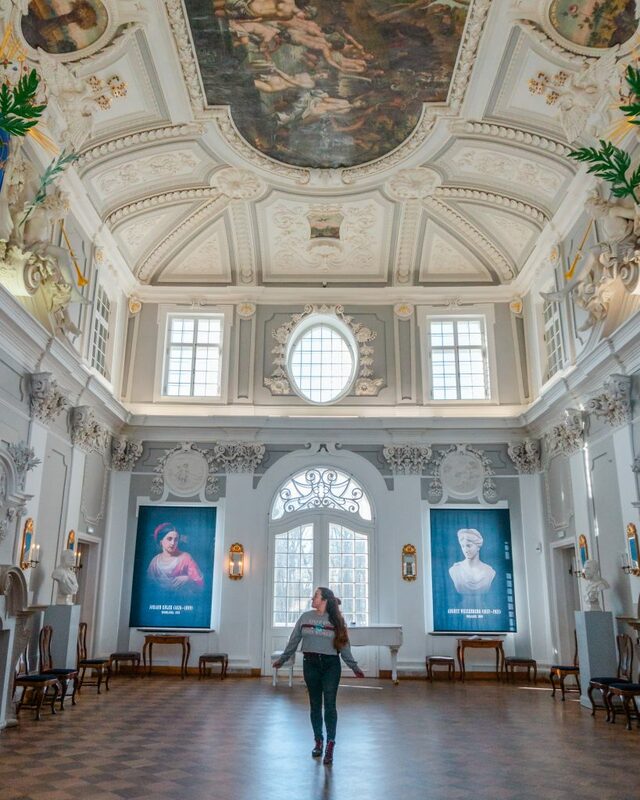 The palace is now home to the foreign art collection of the Estonian Art Museum. Even if you aren’t much of an art museum person (I definitely am not), the palace is still well worth a visit for the incredible architecture and interior design. The park is best seen in spring or summer as in winter (when we went) the garden is covered to protect the plants from frost and snow. Head back to the city centre on the tram 1 (get off at Mere Puiestee or Kanuti) to visit the KGB Prison Cells. Located at Pagari 1, this building was the KGB Headquarters in Estonia and is a symbol of the Soviet oppression of the Estonian people. The basement of this building was where people were interrogated and tortured before either being shot or sent to gulags (forced labour camps) in Siberia. The ‘Estonian Soviet Socialist Republic’ (ESSR) was occupied by the USSR from July 1940 until July 1941. It was then occupied by Nazi Germany from 1941 until 1944 until the Soviet Union occupied the country once again in 1941. On the 20th August 1991, Estonia declared independence from the Soviet Union and this was finally recognised by the USSR on the 6th September 1991. The prison cells museum is only a small museum and is easily visited in around 30-60 minutes. It highlights the main events from 1940 until 1991 and in particular highlights the interrogation and torture that occurred there until 1950, which was when the detention centre was used until. Entry: free with the Tallinn Card, otherwise €5 for adults and €4 for children, seniors and students. Wander back towards the Town Hall Square (Raekoja Plats) and admire the beautiful and colourful buildings that surround the town hall in the centre. 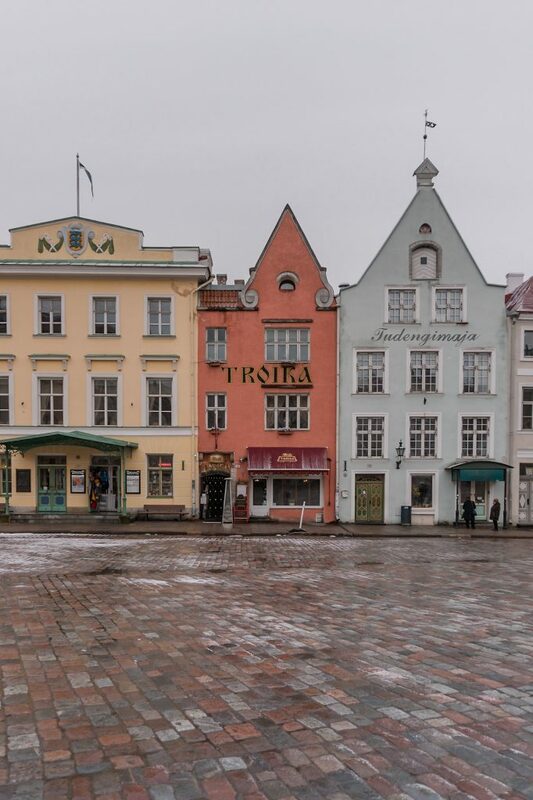 There has been a town hall square in this spot in Tallinn since the mid-14th century when the town hall was built. 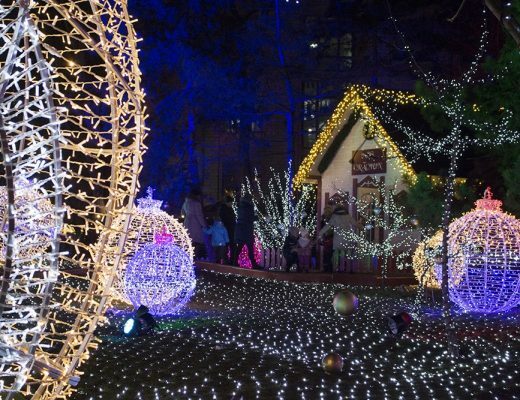 It is the location for regular markets, as well as the Tallinn Christmas Market and the Tallinn Christmas tree – it is thought that the world’s first Christmas tree was erected here in Tallinn in 1441! If you are visiting Tallinn in the summer, you can visit the Tallinn Town Hall (Tallinna Raekoda). It is the oldest town hall in the Baltic and Scandinavian regions! First built in 1322, it was reconstructed in its current style in 1404. The town hall is only open to visitors during summer and a few dates in winter – you can visit Monday to Saturday from the 25th June – 31st August (10am – 4pm) or the 2nd – 6th January at the same times. If you are following this itinerary, I would recommend visiting the town hall before the KGB Prison Cells as they are open slightly later until 6pm. The Raven Cafe is located a few minutes walk from the Town Square and is an ideal cafe for a warm drink on a cold day! 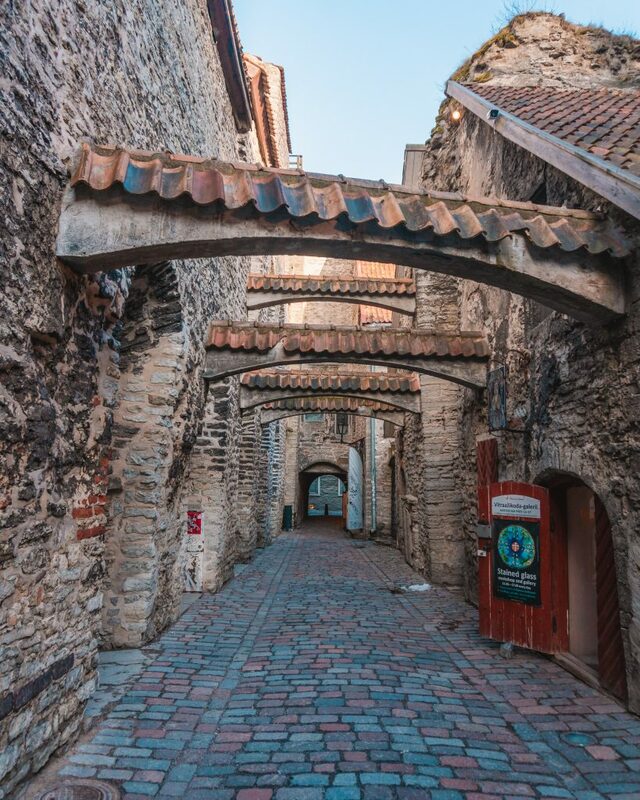 You can take a small detour to walk through St Catherine’s Passage (Katariina Käik), a picturesque medieval lane that connects Vene Street with Müürivahe Street. This passage is still home to the St Catherine’s Guild, a collection of craft workshops where artisans use traditional methods to make handicrafts like glassware, ceramics, and jewellery. This is definitely one of the best places to see the sunset in Tallinn! A 13-minute walk from Raven Cafe or a 10-minute walk from the Town Square, Kohtuotsa Viewing Platform (Kohtuotsa vaateplats) offers a beautiful view over the Old Town. 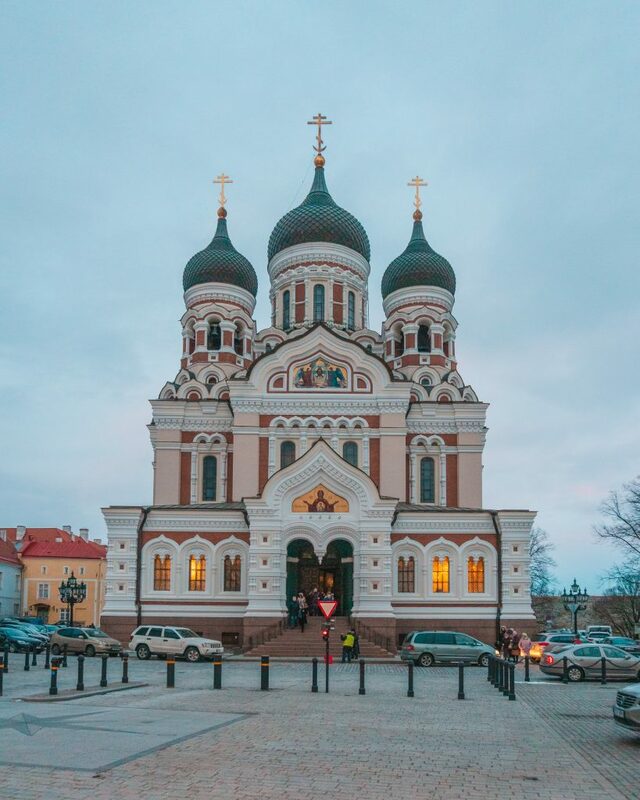 The viewing platform is located on Toompea (Cathedral Hill, from the German ‘Domberg’) and you’ll find St Mary’s Cathedral (Toomkirik) and the Alexander Nevsky Cathedral (Aleksander Nevski Katedraal) on the walk to Kohtuotsa. 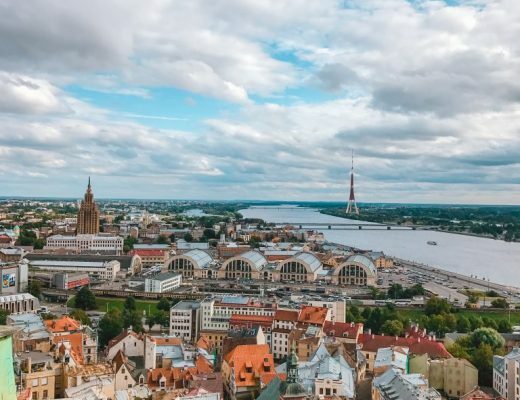 From the viewing platform, you will be able to see icons of Tallinn such as St Olaf’s Church as well as the port and the Gulf of Finland in the background. 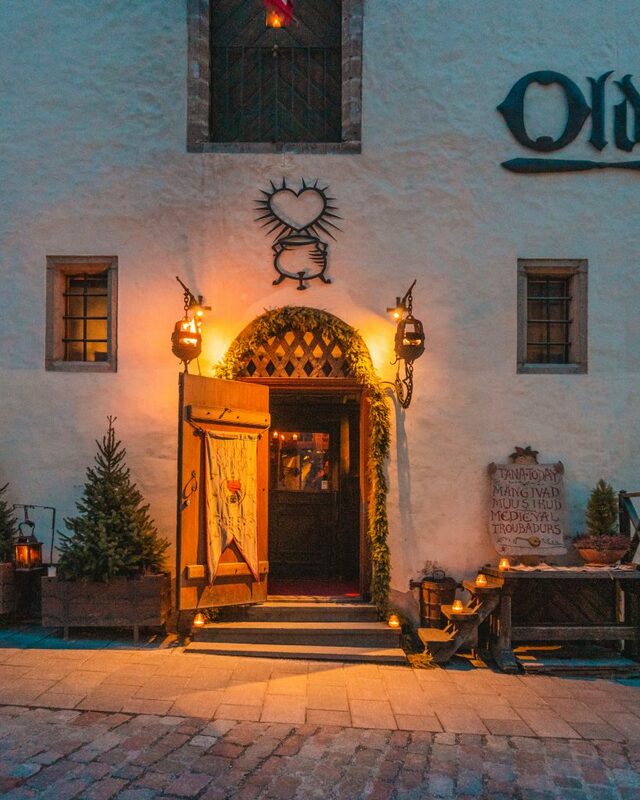 Finish your first full day in Tallinn with a delicious medieval-style dinner at Olde Hansa! 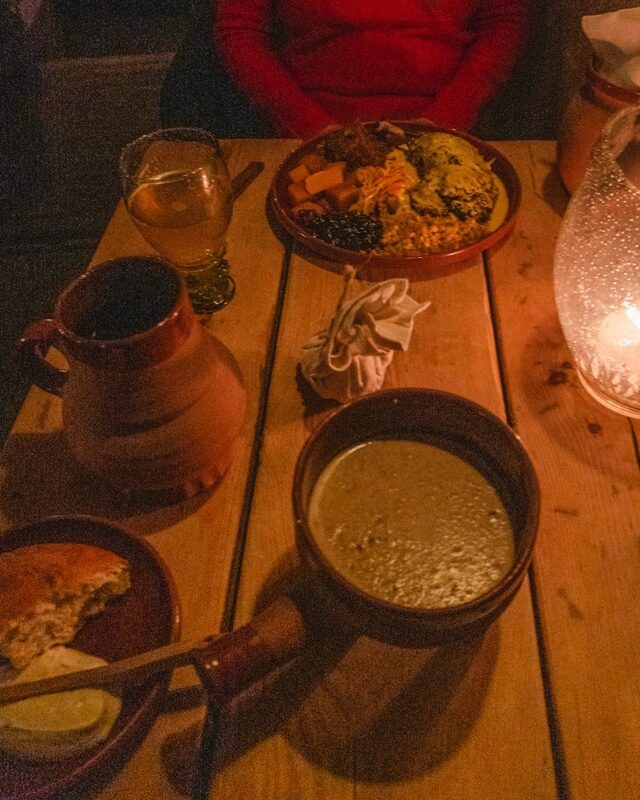 Considering one of the ‘most authentic medieval dining experiences’, you will enjoy excellent Hansa-era food and drink made using 15th-century recipes and methods. I highly recommend the Earl’s Forest Mushroom Soup (this one is vegetarian) as well as the Dried Elk Meat. I found the dried meat a bit too dry but using it as ‘croutons’ in the soup was definitely the best idea I had. DELICIOUS! The soup is also served with their homemade nutty herb bread and a herb cheese spread – I ended up ordering more bread and cheese because it was actually divine. So good! The honey dark beer is also a top recommendation – it wasn’t too heavy or too sweet and I absolutely loved it. It’s also served in a tankard which just makes all beer better, right? It was pretty dark in the restaurant so not optimal conditions for a photo! If you’re feeling extremely hungry, you can opt for the ‘Master Cook’s Feast’ with 17 different delectable dishes (sorry, got carried away with the alliteration). The feast is €42 per person and is great for groups or events. When travelling as a group (or during peak travel periods), I would recommend booking a table in advance! It’s a very popular place, especially when cruise ships are in port. Additionally, book a table and put in writing if you have any dietary requirements so you can help them plan for this in advance. Book a table on their website! Start your day with a visit to the Hellemann Tower, one of the towers that makes up the old town walls. This 14th-century tower opens at 10am and after a short climb you will reach the first viewing level of the tower, where you can walk along a section of the original town wall. Don’t miss climbing to the second viewing level – most people miss this! There is a small door/window that’s a bit stiff but you can open it, it offers the best view over the city from the walls in my opinion. You can see the Alexander Nevsky Cathedral, St Olaf’s Church, the Town Hall and more! 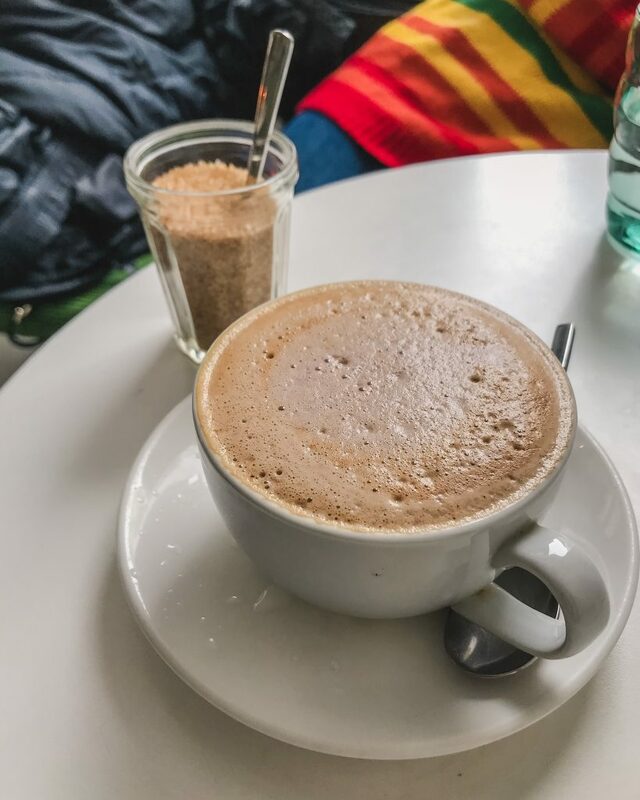 After your morning visit to the walls, grab a coffee at this excellent little cafe which is only a short 5-minute walk from the Hellemann Tower. The coffee is great and they also offer smoothies and juices as well. If you’re there around lunchtime (or if you visit before the tower), they do delicious breakfasts and other meals. You can also do this when you visit the Kohtuotsa Viewing Platform, but when we visited the first time they were just finishing mass so we couldn’t visit and came back the next day (also to revisit the viewing platform because we had fresh snow overnight!). You can’t take any photos or video inside the cathedral (which is a shame), but it’s definitely a beautiful interior to see. This cathedral is an Orthodox cathedral and was built in Russian Revival style in the late 19th-century when the country was part of the Russian Empire. It’s a seriously impressive piece of architecture and definitely deserves a visit! 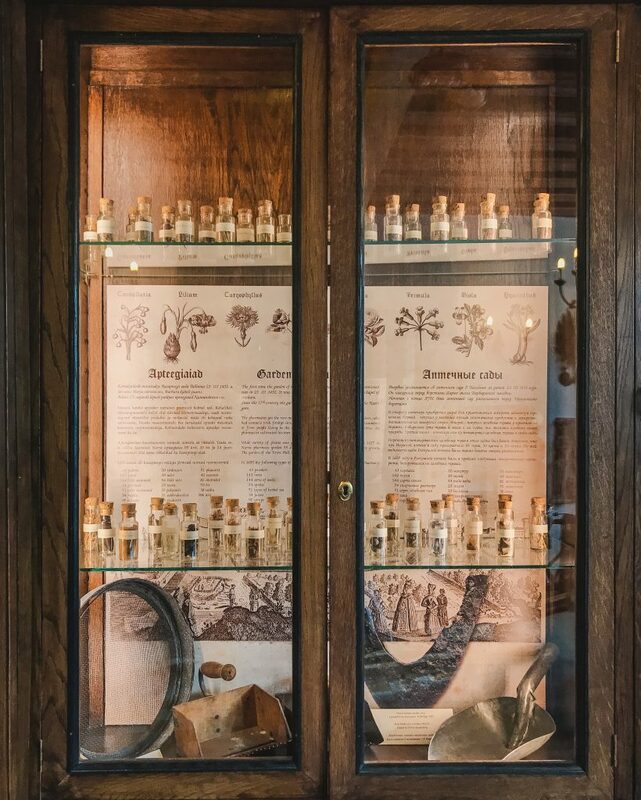 The Old Pharmacy, or Raeapteek, is located on the Town Hall Square and is one of the oldest continuously running pharmacies in Europe. 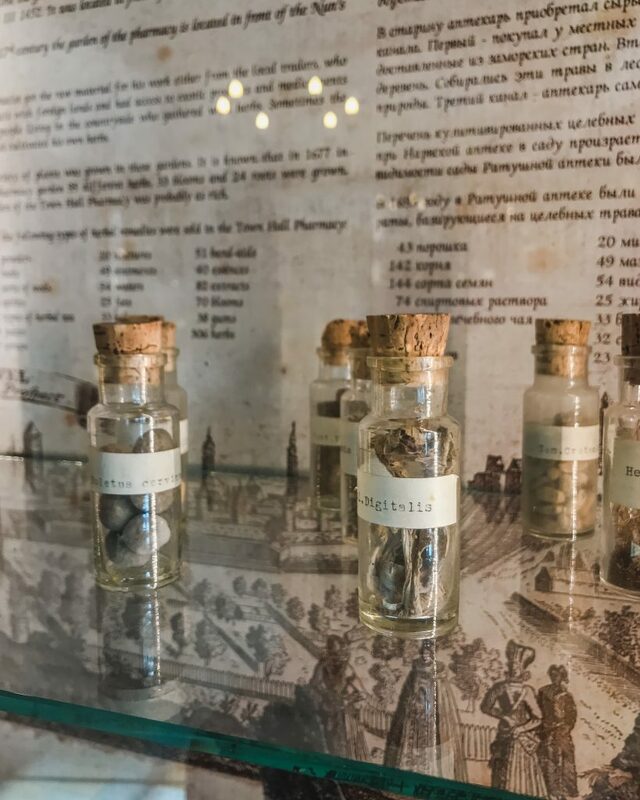 It has been located at number 11 since the early 15th-century and is still in operation today as a modern pharmacy. 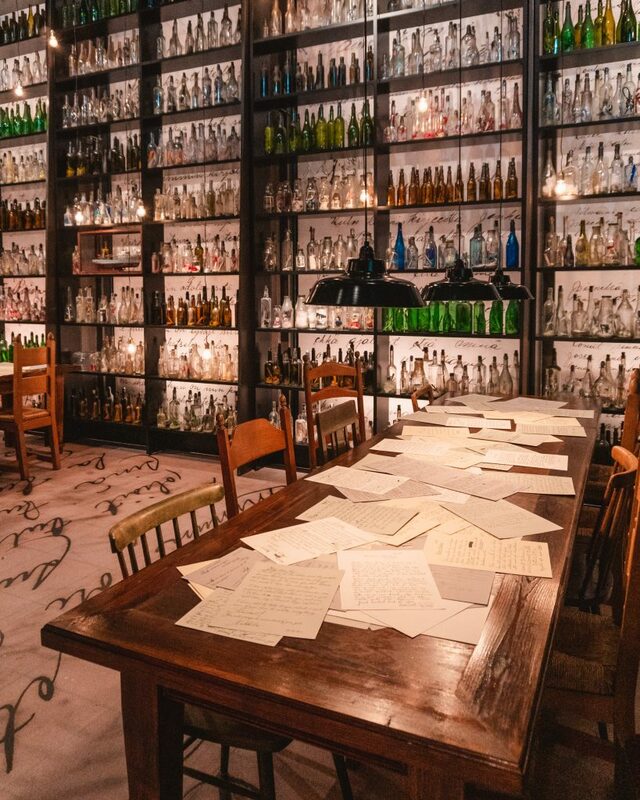 There is also a room that serves as a museum with displays about old medical instruments, historical remedies and more. It’s definitely interesting (and sometimes quite disturbing) to see what served as a medication in medieval times! St Olaf’s Church (Oleviste kirik) was built in the 12th century and offers one of the best views over the Old Town. The church is the city’s biggest medieval building and was named after the Norwegian king, Olav Haraldsson. Unfortunately, the tower isn’t open during winter so we couldn’t visit when we were there, but you can still visit the church if it’s open. The tower is open from the 1st April to 31st June (10am-6pm), then 1st July – 31st August (10am-8pm) and 1st September – 31st October (10am-6pm). Entry: Free with the Tallinn Card, otherwise €3 for adults, €2 for students and €1 for children. This was definitely one of my favourite places for food in Tallinn! 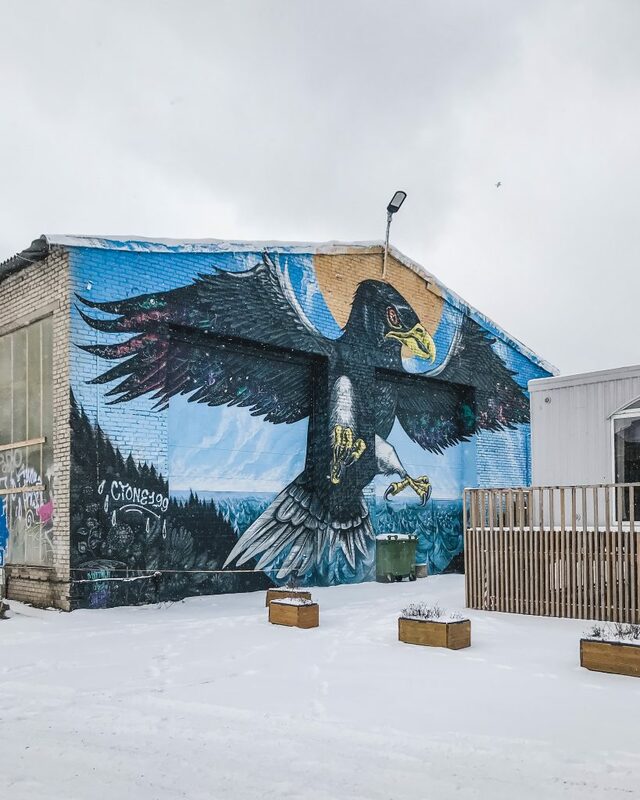 This market, or ‘Baltic Station Market’, is located right next to the train station in Tallinn and is home to more than 300 different retailers. The street food market is open every day of the week, Monday to Saturday 9am-8pm and Sundays 9am-6pm. There are lots of options so have a wander around the market and see what catches your eye! Most of the street food stalls are in the covered building but there are a few (like Khachapuri King, serving yummy khachapuri, a great Georgian dish) in the open-air part of the market. Unfortunately, there’s no real convenient place to sit and eat after getting food from a variety of different places as each street food stall has its own seating area. Hopefully, this might change in the future though! You can probably buy food from different places and sit down with them all at the last place you buy something from though. After exploring Balti Jaama Turg, head to Telliskivi. 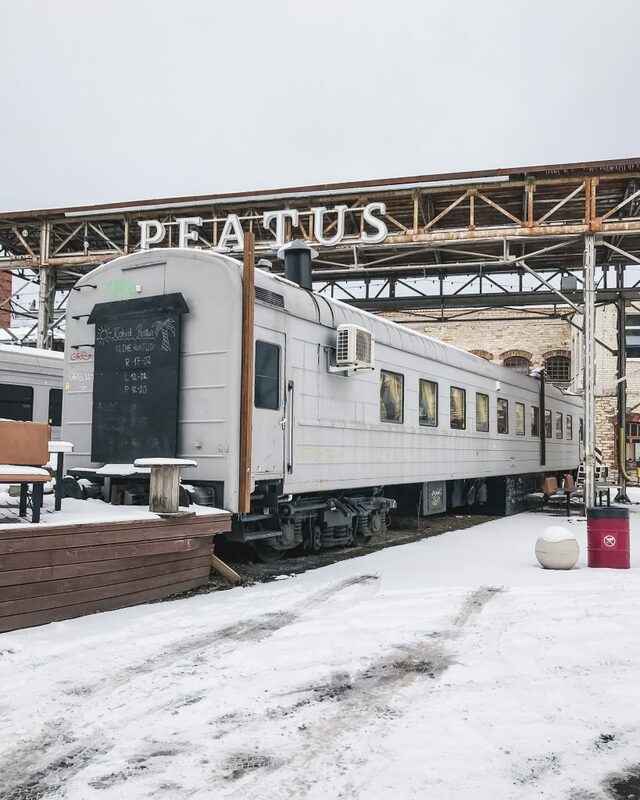 You can stop by DEPOO on the way, another market located at an old train depot that has a variety of shops including antiques and second-hand clothing, as well as food truck style street food places in containers and old train wagons, including coffee shops, craft beer, waffles, burritos and more. After DEPOO, you’ll get to Telliskivi. 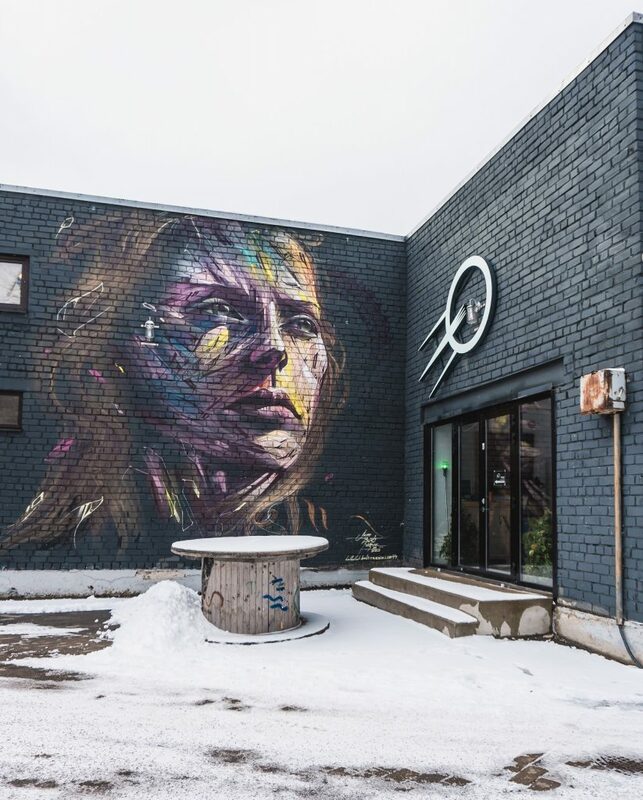 Telliskivi Creative City (Telliskivi Loomelinnak) is located in a reclaimed factory complex (11 industrial buildings that were formerly part of the Baltic Railways factory) and is home to many independent shops such as local designer stores, coffee shops and restaurants. If you’re looking for unique fashion and homewares then Telliskivi is a great place to go shopping! 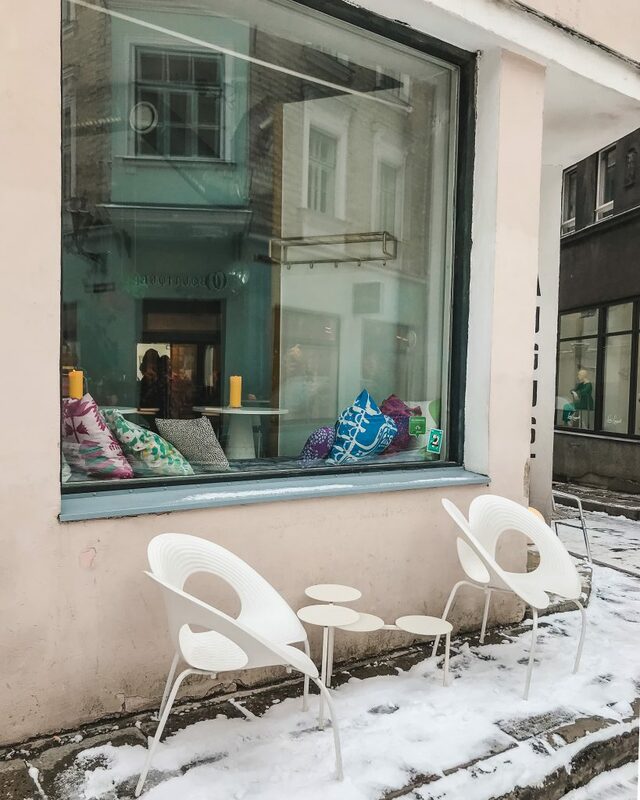 We explored the different stores and stopped for a coffee at Fika, a small cafe with delicious coffee and lots of baked goods. 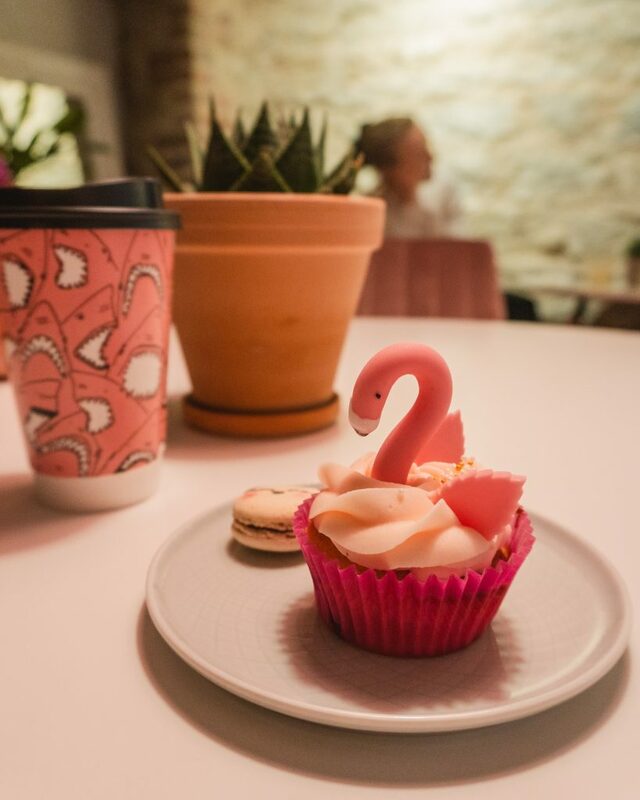 The cafe is designed around the Swedish concept of ‘fika’, a break for coffee and a bite to eat with friends. Try one of the savoury pastries or enjoy a classic cinnamon bun (Kanelbullar). 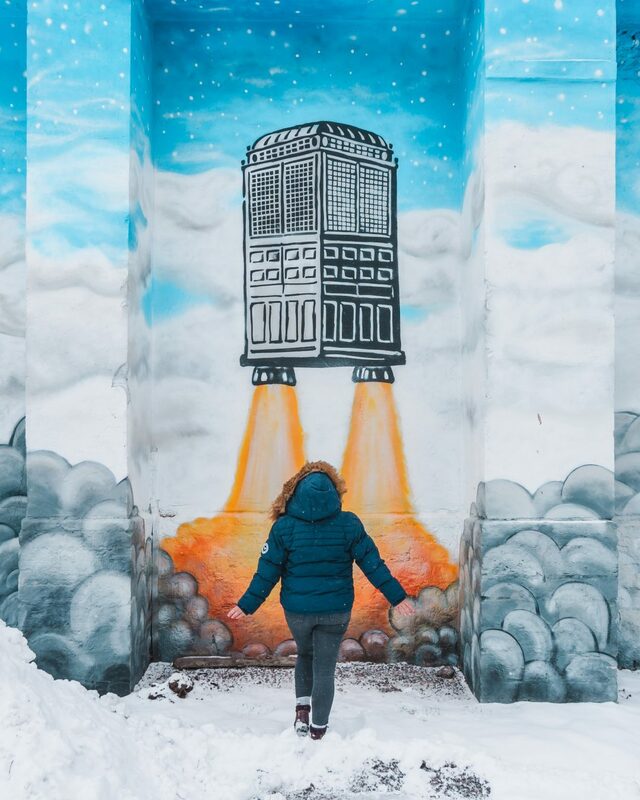 Don’t forget to explore Telliskivi to see all the murals as well – the creative city is home to some incredible street art! The majority of them are located inside the complex so it’s easy to see them all. 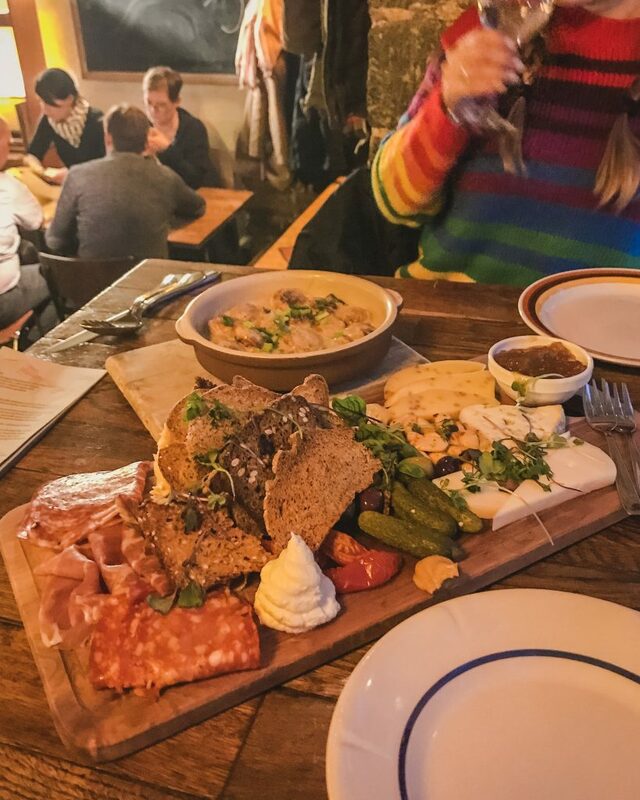 End your day with a delicious dinner at F-Hoone (‘Building F’), a popular restaurant located within Telliskivi Loomelinnak. We made a reservation just in case, but it turned out we didn’t need it for a Sunday evening for only two people. If you’re a large group or visiting on a Friday or Saturday night then I would recommend making a reservation just in case! The food at F-Hoone is absolutely delicious and I’m pretty sure I still dream of the dumplings! We opted for the snack platter for two (SO. GOOD.) 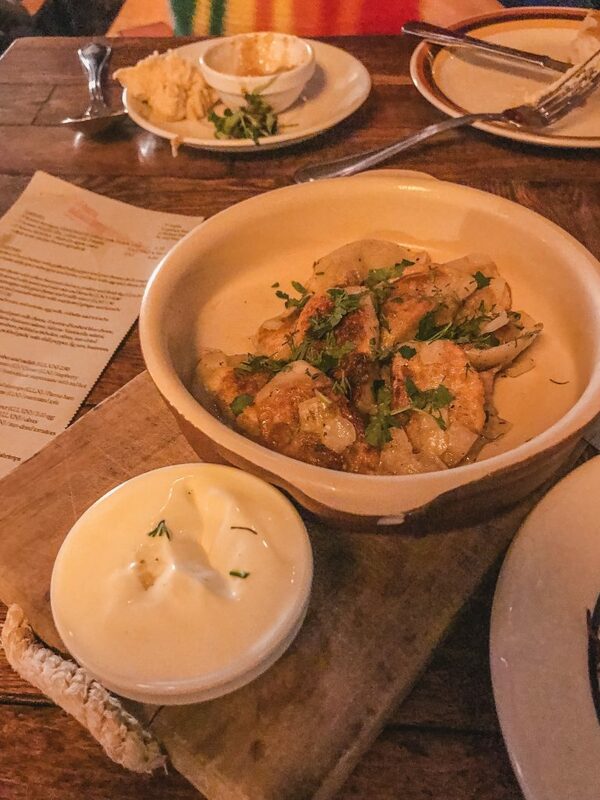 as well as the mutton dumplings in a mushroom sauce and mushroom varenyky with sour cream and herbs. I definitely ate way too much and felt like I was going to explode but it was definitely worth it. It was also ridiculously cheap – for all the food and drinks (two alcoholic drinks) we paid less than €30 in total for the two of us! The snack platter for two and mutton dumplings. Yum! Mushroom varenyky with sour cream and herbs. Also located near Telliskivi Creative City is St Vitus, a craft beer pub and taproom. We visited and enjoyed some local beers before heading to dinner (they close earlier at 9pm on Sunday and Monday) – if you’re a fan of dark beer then I highly recommend the St Vitus TUME (literally St Vitus DARK). They also have other Estonian beers, international beers, local and international ciders and more! You can either walk back into the old town (15 minutes) or take tram number 1 or 2 back to the centre. 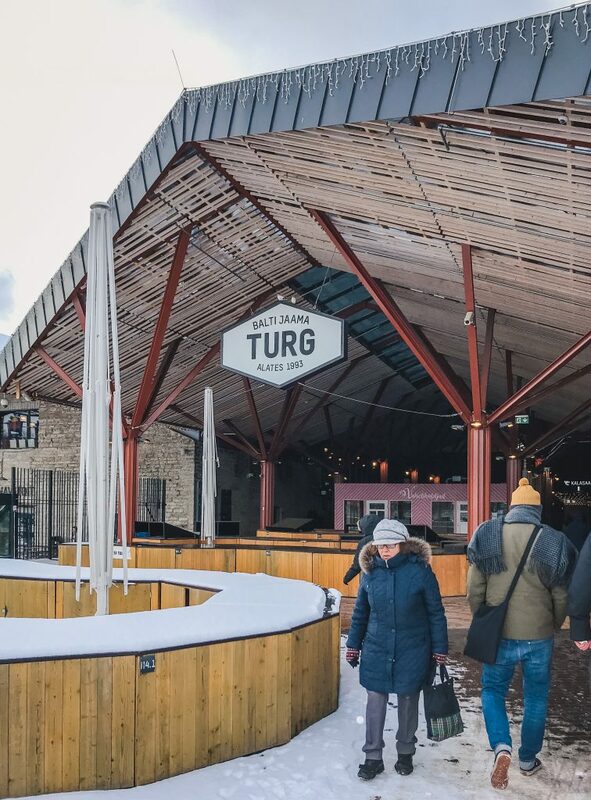 There is truly so much to do in Tallinn – you can make this itinerary last more than two days if you have longer in the city! Combine your trip with a visit to Riga and Vilnius or take a ferry over to Helsinki or even to St Petersburg. 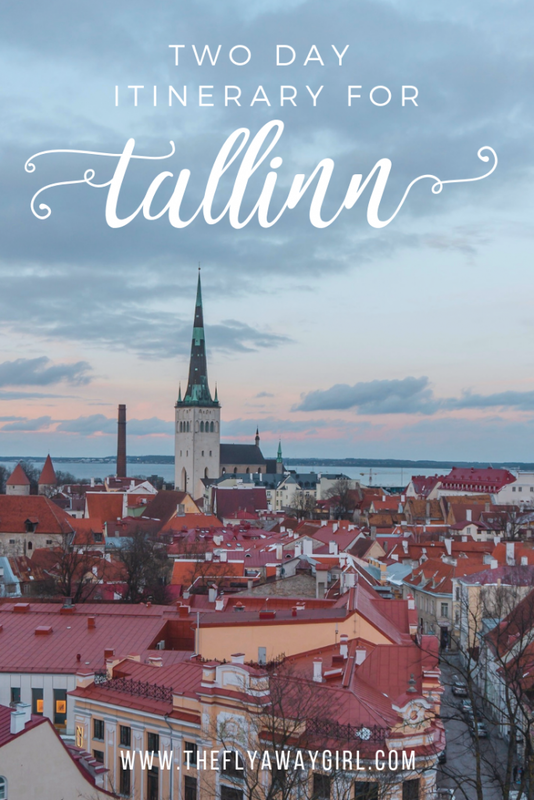 Let me know in the comments if you’ve been to Tallinn or are planning a trip there soon! Don’t forget to pin this if you found it useful!